In the US, revenues for new, emerging product categories are expected to double in 2015 with strong demand for 3D printers, 4K Ultra HD TVs, connected home products, unmanned systems and wearables. According to the Consumer Electronics Association (CEA), US consumer electronics industry’s revenues are expected to grow 3% year-on-year in 2015, to a record USD 223 billion (up from USD 217 billion in 2014). US consumer sentiment continues to improve thanks to solid economic growth rates, lower gas prices and a recovering job market. That said, US consumers still remain somewhat cautious in their discretionary spending, continually looking for the best deals. This continues to fuel the on-going price competition among consumer electronics/ICT retailers and the need for more promotional activity, which in turn continues to put pressure on margins and causes competing firms to find ways to reduce their expenses in an industry with heavy R&D spending requirements. Smartphones and tablets will remain the top two revenue drivers in the segment, accounting for about 35% of total consumer electronics revenue. That said, revenue growth for these devices, particularly tablets, has slowed as product categories have matured. According to CEA, unit sales of smartphones are expected to reach USD 169 million in 2015, up 6% year-on-year. Total smartphone revenues are projected to reach USD 51 billion (up 5%). Sales of tablets are expected to grow 3% (up to 81 million units) with revenues reaching USD 25 billion, down 1% year-on-year. Revenues for new, emerging product categories are expected to double in 2015 with strong demand for 3D printers, 4K Ultra HD TVs, connected home products, unmanned systems and wearables (e.g. health and fitness devices along with smart watches). Revenues in the global 3D printing industry rose 34% in 2014 with the numbers of printers shipped increasing 68% as many consumers purchased their first 3D printers. Increased volumes were driven by more affordable and lower price options. With expected growth in new vehicle sales in 2015, manufacturers of automotive electronics and audio systems are likely to benefit from higher utilisation of 4G technologies. It is expected that by 2020, 75% of all cars will be connected to the Internet. On the negative side, traditional PC/desktop sales will continue to be weak in 2015 as businesses slow the rate of PC replacement and consumers spend their money on tablets and smartphones. The outlook for the telecom and semiconductor segments remains positive. Investments in infrastructure remain strong within the telecom sector as wireless providers look to expand network capabilities and improve service offerings. 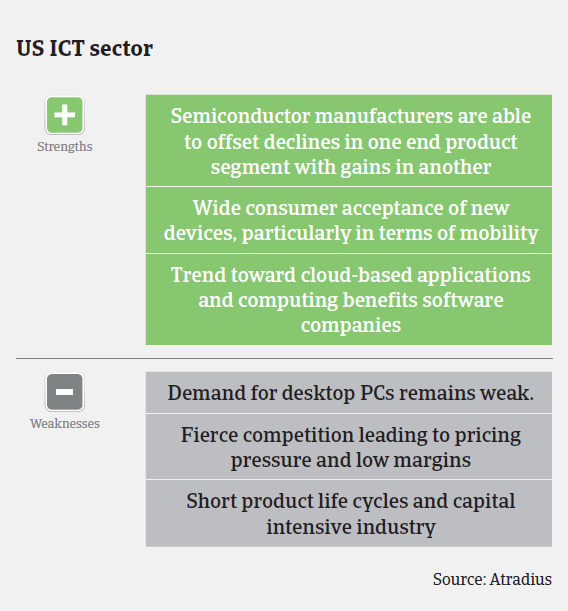 Given the role of semiconductors within mobile devices and consumer electronics, this is likely to remain an important economic driver for the foreseeable future. According to the US Semiconductor Industry Association (SIA), the US semiconductor market alone posted double-digit growth in 2014, with US semiconductor company sales totalling USD 173 billion, and the outlook for 2015 remains promising. The industry represents one of America’s top exporters, employing nearly 250,000 workers and continues to be a leading job creator in the US economy. Payment terms in the ICT sector still commonly range between 30 and 90 days. When payment delays occur, they generally relate to disputes over product pricing or other issues, as opposed to liquidity concerns. Manufacturers often offer price protection or discounts on products in order to move inventory ahead of the rapid innovation of technology experienced in the market. This can lead to disputes and ultimately an increase in non-payments until the issues can be resolved. It is expected that the payment trend for 2015 will be on par with that of 2014 with little change in the overall payment behaviour. 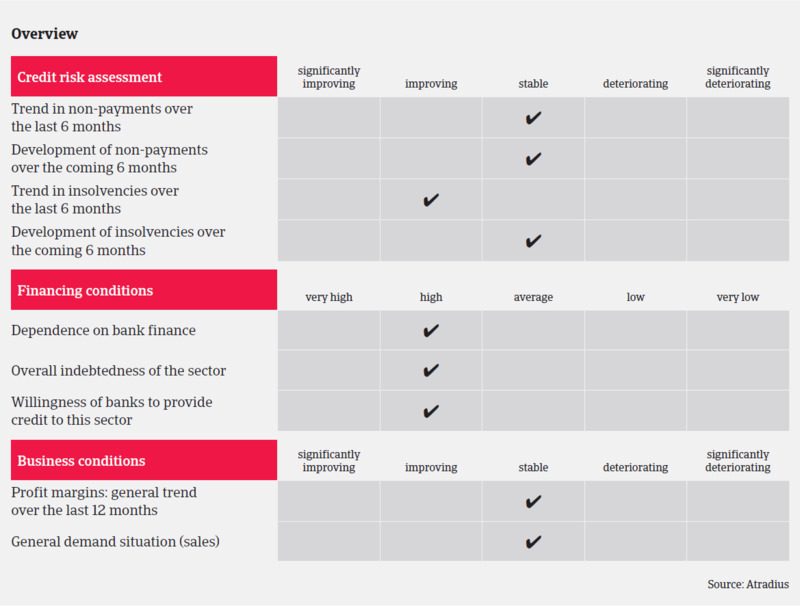 While the level of insolvencies is expected to remain low, they will nevertheless occur, given high competition, many start-ups and short product cycles. As in 2014, our underlying underwriting strategy remains cautiously open with a focus on favourable subsectors such as smartphones, tablets and health technology products along with other emerging technologies, while steering clear of unfavourable or declining subsectors like PCs. 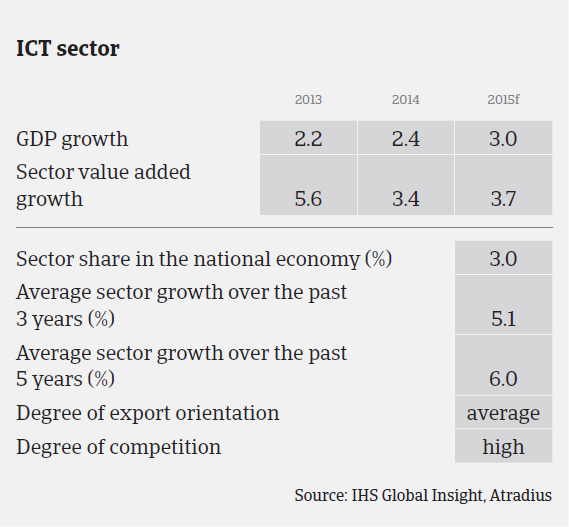 Despite the mainly robust growth rates in many ICT segments, high competition is still leading to low pricing strategies and margin compression for distributors and retailers alike, with many looking to offset pricing pressures by expanding into higher margin product categories. Many businesses continue to rely heavily on bank facilities and external financing, resulting in leveraged balance sheets. Given the recent currency devaluation in some Latin American markets, we have seen some exporters impacted by cash flow issues in this region. Product life cycles still remain short and therefore a company’s long-term sustainability is driven by innovation and its ability to develop new products and bring them quickly to market. Therefore, when analysing buyers, the level of transparency in their products and their life cycles – including any insight into buyback arrangements for old or obsolete products – is key. With short life cycles and technology quickly becoming obsolete, it is important for us to know which end markets and subsectors are being served.